»Culture & Arts»Club GASS: Back To The 90’s – Dress Up Club Night! Club GASS: Back To The 90’s – Dress Up Club Night! You’re in for a great night this month with Club GASS! 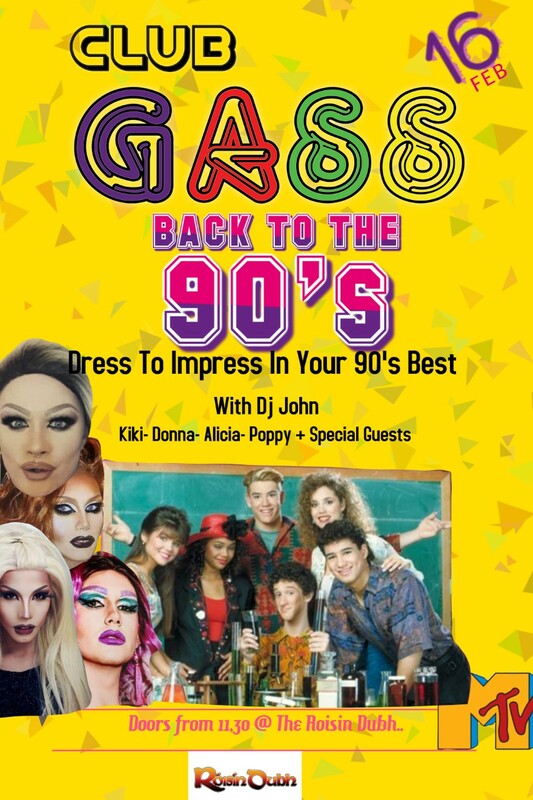 It’s a Back To The 90’s dress-up, so whether you dress like Britney Spears, the Spice Girls, MC Hammer or Pulp, you’ll be strutting your stuff in the company of Miss Kiki St Clair, Donna, Alicia and Poppy. There will, of course, be some special guests, and DJ John is the man with the nineties music! The whole shebang is at the Róisín Dubh, Dominick Street, in Galway, on 16th February, and doors are at 11.30 pm.